← Happy 100th Birthday Julia Child! Last year, I made homemade cranberry sauce for the first time. It is so easy to make and so much better than the canned stuff (and we love the canned stuff), that I swore I would make it every year. I was able to purchase a 36 ounce bag of cranberries from my local food warehouse for $4.97. This contains 12½ cups of cranberries or enough for 2½ batches of cranberry sauce. I love the spiced version, but my kids love the non-spiced so I made some of both. It only took a little over an hour and making this a few weeks before Thanksgiving allows the sauce to completely gel and mellow in flavor. I preserve my sauce so that I can store it in the pantry, but you can easily make a batch and put the jars into the refrigerator until ready to serve. I ended up making 3 batches – some for our Thanksgiving dinner and some to share. Try making some for your family – you will not be disappointed! My kids love cranberry sauce. Jellied cranberry sauce. Opened and nudged out of the can into a bowl and sliced. My kids will even go into the pantry, find the cans, and put them into the refrigerator so that they will be good and cold and ready to eat. Seriously, we will go through several cans at Thanksgiving dinner alone. It is the one Thanksgiving dish that I have never made from scratch. Every year I hear about people making homemade cranberry sauce, but I have never taken the plunge. Until this year. The one thing that I knew I would have to do, though, was to make the jellied version. My kids would never tolerate whole berry cranberry sauce. The November 2011 issue of Food Network magazine included a poll on cranberry sauce – 54% prefer canned and jellied cranberry sauce and 46% prefer the whole-berry kind. So, I researched various cranberry sauce recipes and finally went back to my Ball Blue Book and started experimenting. The first batch that I made followed the Ball Blue Book recipe that said it would yield “about 2 pints”. I used a food mill, but my yield was only one full pint and part of a half pint. For my second batch, I used a food processor and adjusted the measurements slightly to ensure that the result was 2 full pints. After a few more batches, the following recipe is the result. I processed my cranberry sauce in canning jars so that I can store them in my pantry, but there is a recipe on the bag of the cranberries which you can make and store in the refrigerator. 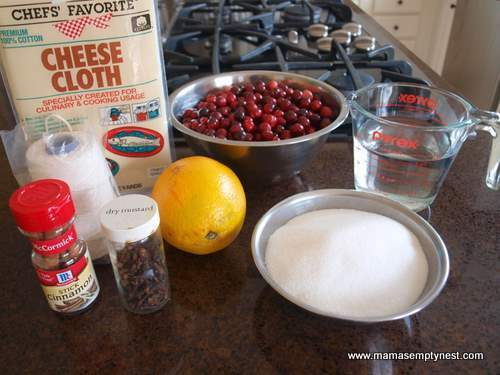 Add the spice bag component to it, and you will have fabulous, homemade cranberry sauce for your holiday table! Since part of the fun of cranberry sauce is that it slurps out of a straight-sided can in a perfect cylindrical shape, I went and found some straight-sided, pint-sized canning jars. Just to make homemade cranberry sauce. By now, you know, I could have bought a case of the canned stuff. Homemade Jellied Spiced Cranberry Sauce ingredients. Please note that my whole cloves are in a jar marked Dry Mustard. Wash and drain the cranberries. I placed the washed berries onto towel-lined sheet pans to allow them to dry. It also made it easier to pick through them to discard the overripe and under ripe berries. Just run your hands, gently, across the tops of the berries, and you will be able to feel the ones that should be tossed. The spicy part of the recipe involves cutting a piece of rind off an orange, studding it with 6 whole cloves, and tying it along with one cinnamon stick into a piece of cheesecloth tied with twine. Here is the finished spice bag ready to toss into the pot! Note on the spices: The spices made the Cranberry Sauce over-the-top good, but if you want yours plain, they are optional. I also made a batch of plain, homemade cranberry sauce and it is very good, too. 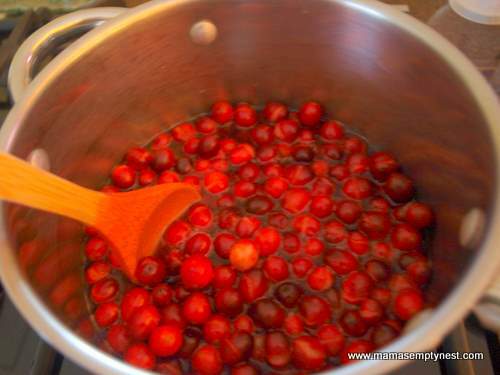 Place the cranberries and water into a large saucepan and bring to a boil over medium to medium high heat. Boil until the skins are popped. This only took about 5 to 10 minutes on my gas stovetop. It was also a fun step because the berries actually make popping noises as they burst. Note on the pictures: I was cooking on a very dark, gray, and overcast day so I struggled with getting enough natural light for good pictures. Getting good pictures of the color red is a challenge, too, for my truly amateur skill level. The pictures actually turned out a little better than I expected, but this one was the best of the lot for this step and doesn’t really represent how truly lovely the burst berries looked in the pot. After the berries have boiled long enough to burst through their skins, you will need to purée them. I used a food mill on my first batch and ended up with a batch that only produced a little over a pint. For all the rest of the batches, I used my food processor. I was concerned that there would still be bits of skin, but the result was a perfectly smooth mixture. This is the way to go. I believe that a blender would produce similar results just be careful when blending hot mixtures – you must do so in small batches! Return the puréed mixture to the saucepan and add the sugar and spice bag. Over medium to medium high heat, return the mixture to a boil and cook until almost to the gelling point (220°F). This step took about 15 to 20 minutes. Turn off the heat. Remove and discard the spice bag. Place the mixture into pint sized canning jars and process in a boiling water canner for 15 minutes. Note: I used a candy thermometer on my first batch and also used the gelling test with a spoon. After a few batches, I could tell by sight when they were ready. The mixtures turns a beautiful dark, burgundy red and becomes glossy and thick. Homemade Jellied Spiced Cranberry Sauce – ready to eat. I cannot believe that it has taken me over 50 years to make and eat homemade cranberry sauce. I’ll tell you right now, I’ll never go back. Hope the kids like it . . . Because I’m not buying the canned stuff ever again. 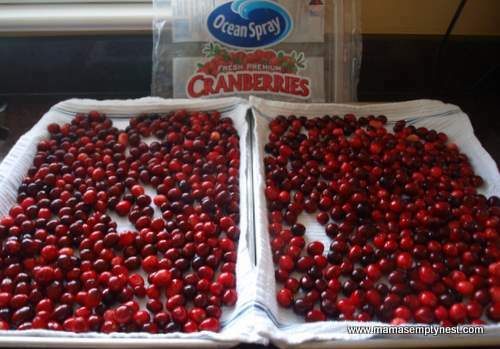 Wash and drain cranberries. Pick through them and discard any that are under ripe or overripe. Combine the cranberries and water in a large sauce pan. Boil over medium to medium high heat until the skins burst on the cranberries. This will take about 5 to 10 minutes, and you will hear the berries popping. Pour the mixture into the bowl of a large food processor and purée until smooth. Return the cranberry mixture to the sauce pan. 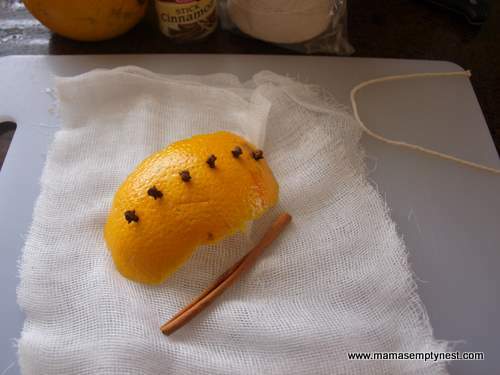 Place the orange rind studded with the whole cloves and the cinnamon stick into a small piece of cheesecloth tied with twine. Add the spice bag and the sugar to the sauce pan and return to a boil over medium to medium high heat. Boil almost to the gelling point (220°F at sea level). This will take about 15 to 20 minutes. You can use either a candy thermometer or gelling tests using a spoon or plate. Refer to Jam and Jelly Basics here. 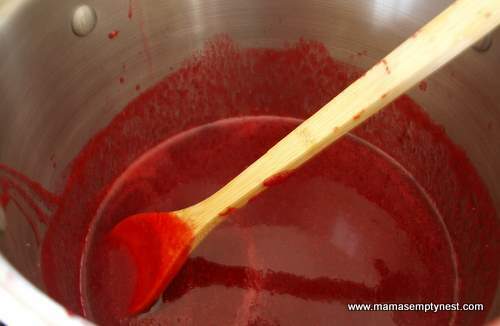 The mixture will be thick, dark burgundy red, and glossy. Turn off the heat, remove the spice bag, and ladle the sauce into hot jars, leaving ¼” head space. Adjust the 2-piece caps, and process 15 minutes in a boiling water canner. Notes: The spice bag is optional. The cranberry sauce tastes great plain, too. If you use straight-sided jars, you will be able to serve as a mold just like the canned version. If you do not wish to use the canning method to preserve the cranberry sauce, you may store it in the refrigerator after cooling to room temperature. This entry was posted in Food & Home and tagged Canning & Preserving, Fruits, Gluten Free, Thanksgiving. Bookmark the permalink. This looks great! I’m trying it out today. Like you, I’ve made everything from scratch but jellied cranberry sauce. I’m new to canning and was surprised to see that there isn’t any pectin. The cranberries must have a lot… Or is it the sugar? Either way, I’m making lots of this today! Thanks for the great recipe and photos! Thanks for visiting! You will be surprised how easy it is to make. I only use pectin when I make Jalapeno Jelly (see post on my site). When I make fruit jams, I don’t use pectin, but am careful to use gelling tests to make sure that they set properly. The good news is that if you have a batch that doesn’t turn out, you can salvage it by cooking some more. I have several Ball Books (some really old and a newer one). They are invaluable in providing guidelines for all of this stuff. wish I had found this last Nov! Will definitly try this year! Thanks! You will never go back to canned again! The nice thing about this is you can make it in advance. The flavors are incredible. I can’t wait to try these different versions! Thanks for sharing. I just made this today and will use half of the amount for Thanksgiving and Christmas but was wondering will the other jars still be good for next yrs holidays? I’m not sure if you processed them or not, but the extension service guidelines that I have read suggest to use up within 6 to 12 months. Share with some friends or serve cranberry sauce with roasted chicken, too! I’m making homemade cranberry sauce for the very first time this year and this recipe is perfect. Can this sauce be served the same day, or is it specifically for preserving? I know very little about homemade cranberry sauce. You don’t have to preserve it. You can make it and store it in the refrigerator; however, I would make it now and not wait until the last minute. If you make the spiced version, it is actually better made a week or two ahead of time to allow the flavors to meld. It is very easy to make and tastes so much purer than the canned stuff! Thank you for the advice. Looking forward to trying it out! Looks great! One question…the skins get puréed as well? No separating? Thanks! Yes! And the result is a totally smooth cranberry sauce! This is seriously one of the easiest made from scratch recipes you can make. One of the beauties of it is that you can make it one to two weeks before you eat it and store it in the refrigerator if you do not process the jars. In fact, the cranberry sauce actually tastes better after it sits for a few days. How long will they last if they’re preserved?? Most extension services state that if properly processed, items should last a year. I make enough for the holidays and to share with friends. 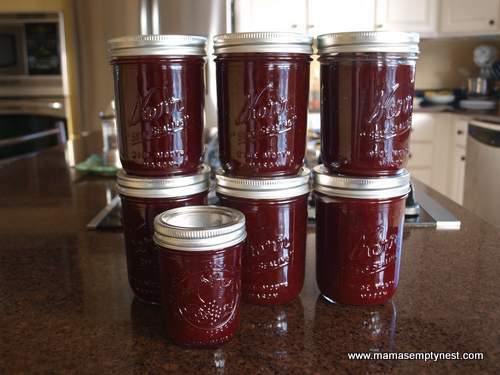 Last year, I purchased some bags on sale after the holidays and made cranberry jam which was also a big hit. I just made mine last night. It looks like it came out right, and my dad tried the finished product from the remnants of a spoon I was using and said it tasted like cranberry sauce. I used a blender which pureed the mixture nicely; however, I noticed what looked like stems in it. My family is a major “NO CHUNKS OF ANY KIND” family, so I strained the puree before adding the sugar. I think this reduced my yield because I only got 1.5 pints from each batch. Also, instead of adding the spice bag, I went minimal and just added a small amount of orange extract. Have you tried a spice ball instead of the cheese cloth? I was wondering if the ball might be easier to work with. I never thought of using a spice ball. You would have to find one big enough to hold the orange peel and cinnamon stick. I don’t think the cheese cloth is hard to work with. I just get it out using a tongs and scrape off the gelled fruit and discard. Thanks for responding. I used the cheese cloth and it was fine. It looks more like a jam, I’m hoping it becomes more jellied over time. I don’t understand what “process” means. I see the recipe refers to processing and also in the comments some folks have mentioned processing. If you cooked it to that deep, shiny burgundy color and poured it into your jars, it should be the perfect consistency once it completely cools. If not, use it as jam! I take my leftover berries and make cranberry jam, and my daughter’s boyfriend’s mother, who loves cranberries, uses my sauce as jam on her morning English muffins. You can make this recipe and simply store the sauce in the refrigerator for two weeks. If you want to keep it on the shelf, you need to “process” the jars. This means you should be using proper canning jars and lids and proper processing techniques including using sterilized jars and lids and boiling the filled jars in a hot water bath canner for the recommended time for your elevation. If you do this, your sauce can sit on the shelf for up to a year. 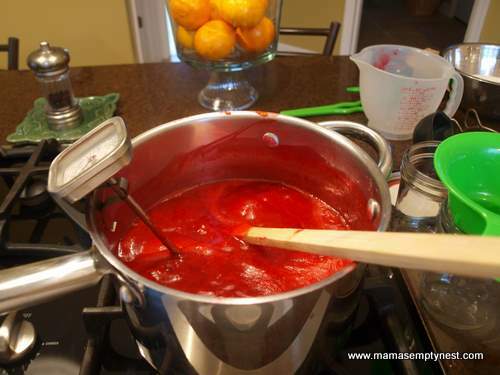 This is how people make jams, jellies, preserves, tomato sauces, pickles, etc. at the end of harvest season to be able to use their home grown produce throughout the year! Where did you find your straight sided jars? I’ve found these jars at Walmart, my local grocery store, and Rural King. Really, you should be able to find them anywhere that sells canning supplies. Homemade cranberry sauce is really good! I hope you enjoy making it and eating it, too. Straight sided jars are also known as wide mouth, if that helps. Actually, wide-mouth jars are not always straight-sided. Jars that are approved for freezing will be straight sided. I believe Jardin (parent company of Ball and Kerr) currently only makes straight-sided 8oz and 12oz jars, and only one type, the short wide 8oz jars, are wide-mouthed. Thanks for the clarification. I use 12 ounce wide mouth, straight-sided jars and still process. I do this so my kids can still “slide” out the sauce like they used to do with the canned. Thanks for visiting! Happy Thanksgiving! I’ve never canned anything before. So, I don’t have a canner. How many days in advance should I make this for it to be ok. I’m going to try both versions. You can absolutely make homemade cranberry sauce and not process it! Store it in the refrigerator. You can make it now and keep it for about 2 weeks or so in the refrigerator. It doesn’t last that long in my house. I usually double the batch and give some to friends. Dumb question, I can only find 12 oz bags of cranberries. How many bags should I get per batch? Thanks in advanced! A 12 ounce bag of fresh cranberries is about 3 cups. 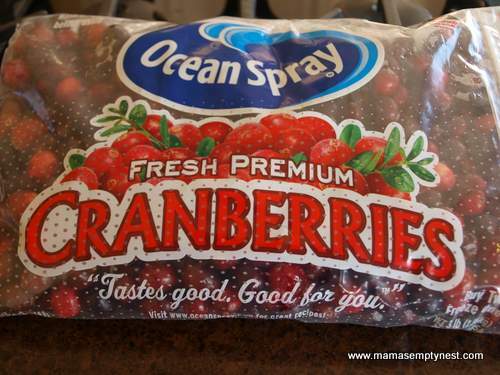 You can get a coupon here: http://www.oceanspray.com/Events-Promos/Coupons/Fresh-Cranberries-Coupon.aspx. Also, I buy up bags after the holidays when they go on sale and put them into the freezer. Hope you enjoy making cranberry sauce! Our commissary didn’t have any fresh cranberries. I got frozen. Is that okay? Do I need to thaw them before boiling? I’m sure using fresh, frozen cranberries would work just fine! I think you could just throw them into the pot frozen or thawed, just cook them long enough for those skins to pop! If I start this today, will it be ready by Thanksgiving( 4days)? If you make it today, it will be ready right away (after it cools anyway), but the flavors are a little better if they have time to meld over a few days. Yes, you have time! I know you will love it! I had leftover cranberries last year and made spicy cranberry jam which I enjoyed all year long. Have you heard from anyone who has tried this substituting Splenda granular for the sugar? No, I have not but here is the information from the Splenda website – http://www.splenda.com/cooking-baking/conversion-charts. No pits in cranberries! Puree away! When I make cranberry-orange curd, I puree the cranberries in my food processor and then push it through a sieve to get the fibers out for a smooth curd texture. How’s the texture of this? Do you feel the cranberry fibers in the jelly? I process until smooth. No need to push thru a sieve. I can’t wait to try this. Do you know if it would gel ok if I made a double batch or would I have to make 2 single batches? Most advice on canning says to not double or triple batches. I don’t think it would make a difference, but honestly you can make a batch so quickly, I wouldn’t. I made three batches of cranberry sauce (two spiced and one plain) and two batches of blueberry jam yesterday morning before lunch. Oh and I go by time and look not temperature. It should still be somewhat pourable but dark and glossy. I love this recipe and double the bath all the time. Always turns out great! I made this last year and it was fabulous. Love the orange and spice taste. I’m making it again today and finding that it takes much longer than 15-20 to get it to 220. Anyone else having this problem? Am I doing something wrong? Don’t worry about getting it all the way to 220. I’ve found that I just need to boil for 15 to 20 minutes and it sets up just fine. With cranberries if you cook too long you can break down the pectin and it won’t set! Anyway, I always cook to site and use the spoon gel test. I’ll look at amending the post. Also, I use my immersion blender that my SIL bought for me a few years ago. Quick and easy! Glad you enjoy homemade cranberry sauce! Do you think an immersion blender can work just as well as the food processor? Absolutely! When I first wrote this post, I did not own an immersion blender. I use it for this and a lot of other things, too! My husband and I do not like the normal cranberry sauce, is there some way I could make the sauce with like raspberries, strawberries, and still have it set up with out using pectin? Well, there is and that would make it jam. I set up most of my fruits without pectin using small batch processing techniques. 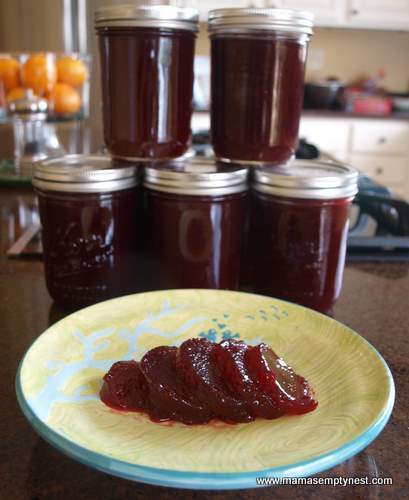 I also make an Amish style cranberry jam which is really just cranberry sauce, but not cooked quite as long. If all you’ve ever had is canned sauce, you might want to try homemade especially the spiced version. It doesn’t take that long to make and tastes a little better if you let it set for a few days. It just has such a pure lovely taste that is so different than canned. does the blending prevent the seeds? There are no seeds but it makes it smooth because of the skins on the cranberries. You could make it chunky without blending. My family prefers smooth. What happens when it doesn’t thicken like you want ? Can a new lid be put on and process it again? I’ve been had a problem with thickening. With jelly you can cook longer so I assume you can with cranberry sauce too. It does thicken as it cools too. Sounds delicious. I really am going to try this recipe. What is the yield if using straight pint jars? The recipe makes 2 pints. 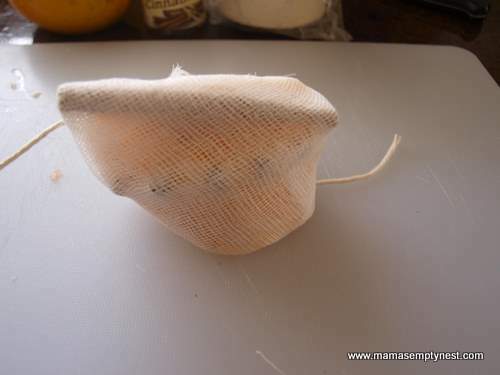 I don’t have any cheesecloth-could I possibly use a muslin bag? I think that would work or a fine sieve will get most of it.